Download "AGENT DEVELOPMENT VNET RESOURCE CENTERS MOST LIKEY USE WATSON REALTY NOT SURE VANGUARD REALTY REMAX"
2 AGENT DEVELOPMENT Vanguard Sales Partners have access to our unique Pro Series agent development program. 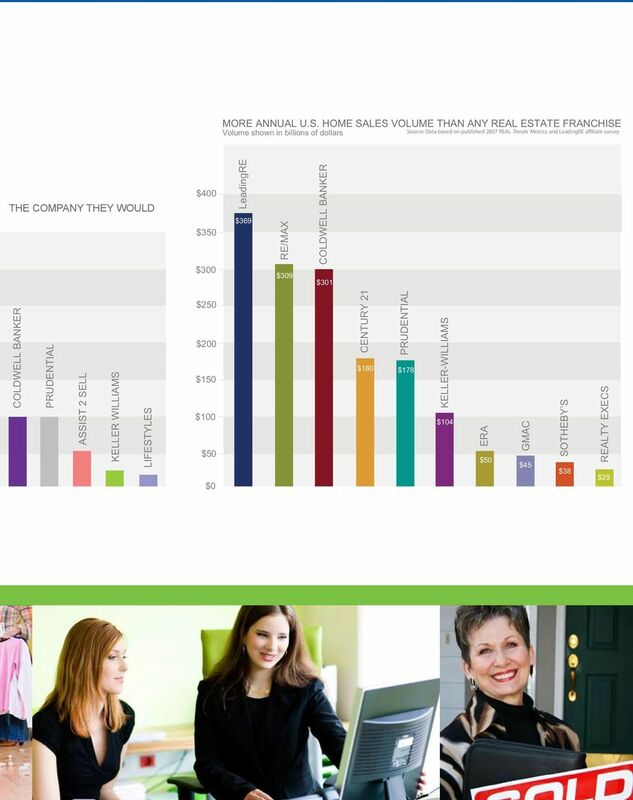 Pro Series features two education tracks; the Elite Realtor Network for Sales Partners with more than five years experience and over $5,000,000 of production in each of the last three years and the Market Movers for agents who aspire to reach new heights. The Market Movers group features seminars and classes conducted by some of our top selling Sales Partners to provide market centric sales information, and also utilizes materials developed by top producing agents in the Leading Real Estate Companies of the World organization. You can rely on the material being freshly designed to help you be at the top of your game. Take your career expertise to a new level. Pro Series classes run throughout the fall and winter months when you have the time to learn new techniques. CONSUMERS SAY THIS IS T MOST LIKEY USE VNET VNET is Vanguard s proprietary back office solution for Vanguard Sales Partners. Find answers, obtain forms, monitor your career and business. Because we wrote the program instead of using a national one size fits all solution, VNET is easy to use and meets all of your needs. VNET is divided into two sections My VNET and My Vanguard. MY VNET is password protected and has the information you will need to know for your business. My Vanguard is your gateway to the resources available, from on line forms to ordering supplies over the Internet. 25% 20% 15% 10% NOT SURE WATSON REALTY VANGUARD REALTY REMAX In addition to My VNET and My Vanguard, there is also direct access to our Concierge, The Leading Real Estate Companies proprietary site, news bulletins and company announcements. 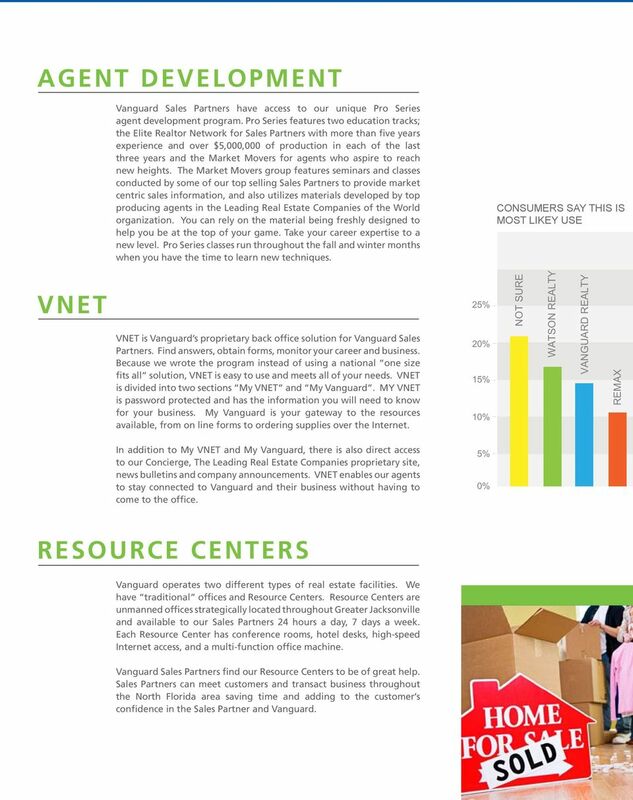 VNET enables our agents to stay connected to Vanguard and their business without having to come to the office. 5% 0% RESOURCE CENTERS Vanguard operates two different types of real estate facilities. We have traditional offices and Resource Centers. Resource Centers are unmanned offices strategically located throughout Greater Jacksonville and available to our Sales Partners 24 hours a day, 7 days a week. Each Resource Center has conference rooms, hotel desks, high-speed Internet access, and a multi-function office machine. 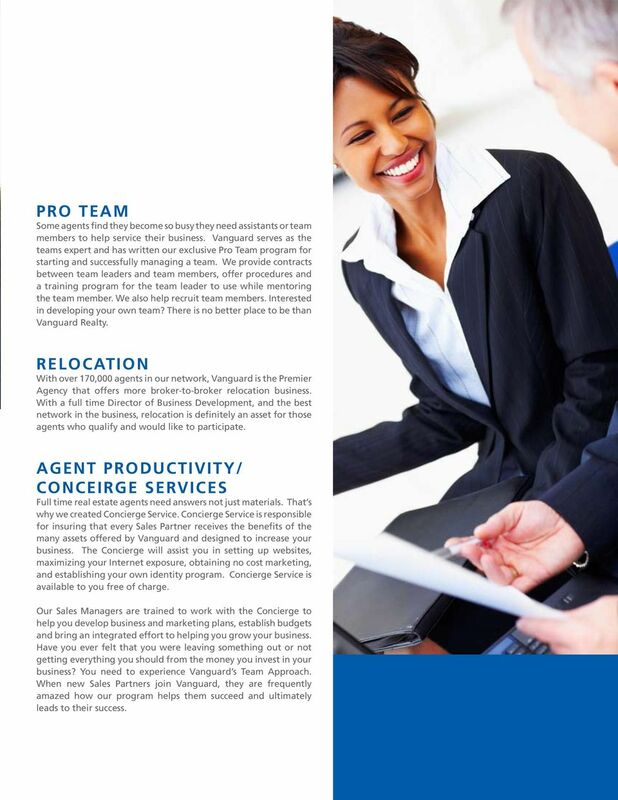 Vanguard Sales Partners find our Resource Centers to be of great help. 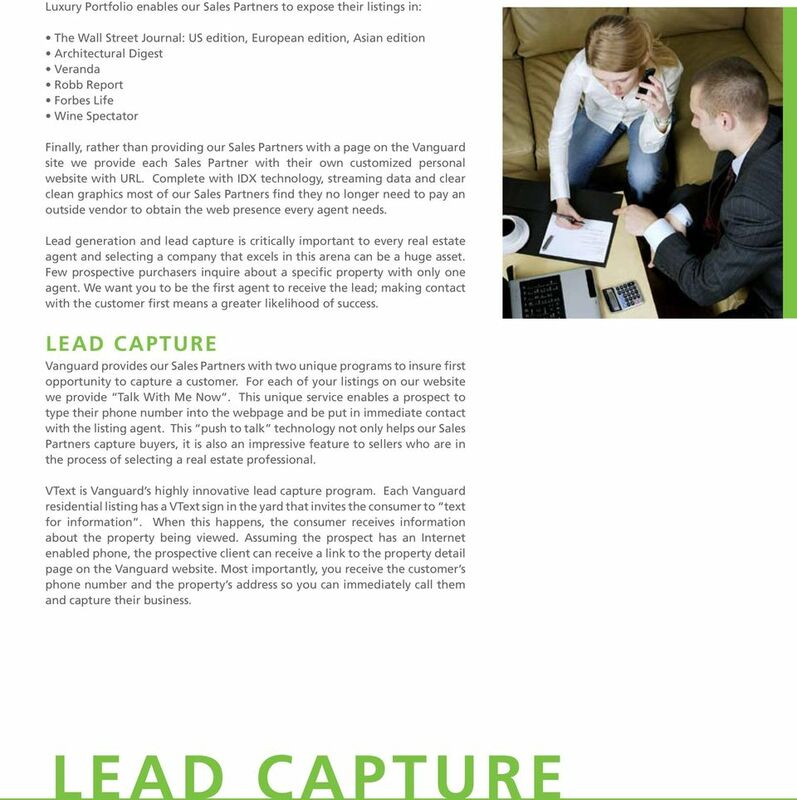 Sales Partners can meet customers and transact business throughout the North Florida area saving time and adding to the customer s confidence in the Sales Partner and Vanguard. 6 PRODUCT ADVERTISING Our Sales Partners know that having the right printed materials can make a big difference in securing a valuable listing. The right printed materials can also make the difference between selling and losing a sale. That s why at Vanguard, we start by taking highly flattering property photos then send them to our Marketing Department and create outstanding marketing. Sales Partners can order whatever they need over the Internet using the VNET Marketing Center. This means they don t have to interrupt their business day to meet photographers, go see printers, or pick up copy. 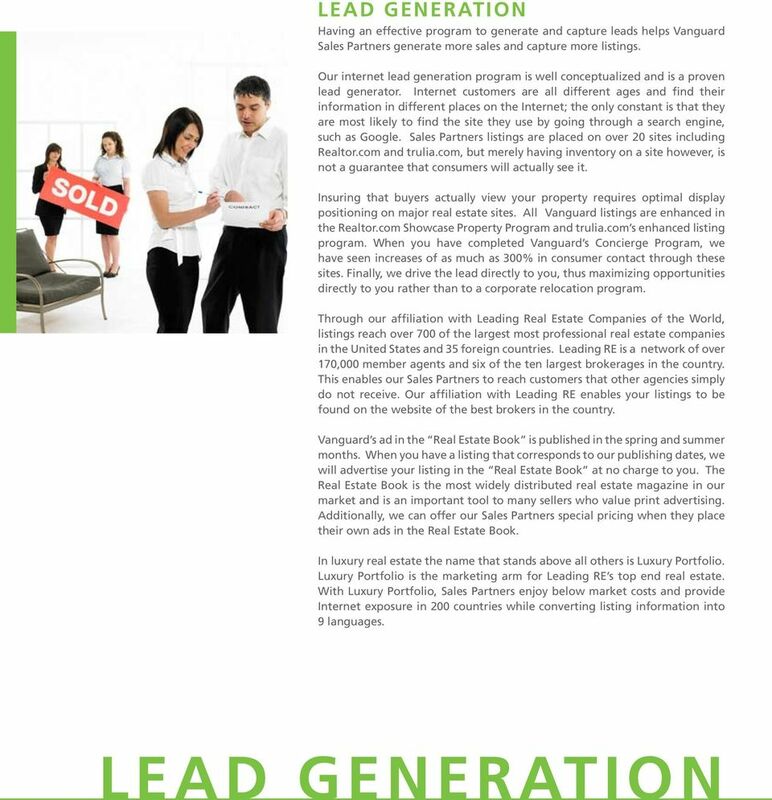 We do it all from personal brochures and seller booklets, to four page property fliers to place in listings. Vanguard handles everything inexpensively even in small quantities. AGENT DEVELOPMENT The reason Vanguard Sales Partners exceed their peers is a direct result of our developmental programs and training. Vanguard has numerous programs that assist our Sales Partners develop new fields of expertise and increase their income and career satisfaction. CLIENT BUILDER Client Builder is Vanguard s exclusive program that enables Sales Partners to maintain valuable listings, move into new markets, attract qualified purchasers and earn additional income. Client Builder is a property management program designed to enable successful agents to manage several rental properties that are generally listings that are not desirable in the present market. By managing this listing the agent maintains control of the property and will, more often than not, have the opportunity to sell the house at a later date. The customer who rents this listing establishes a relationship with the Sales Partner, frequently consulting with the Sales Partner when they decide to purchase. This, in essence, creates two transactions. Sales Partners do the field work for the listings and Vanguard handles all escrow, owners statements, vendor payments and tax reporting. A manager is on staff to advise the Sales Partner if unfamiliar circumstances occur. Vanguard becomes the voice of experience to resolve issues that may occur. Vanguard Sales Partners participating in Client Builder manage over 400 properties and generate over $600,000 of property management commission income annually while increasing their sales income. 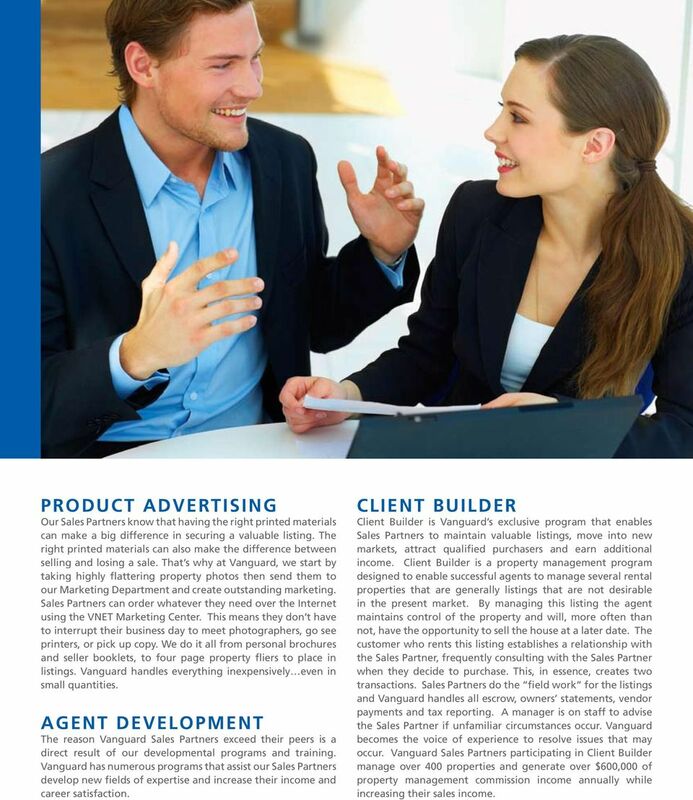 7 PRO TEAM Some agents find they become so busy they need assistants or team members to help service their business. Vanguard serves as the teams expert and has written our exclusive Pro Team program for starting and successfully managing a team. We provide contracts between team leaders and team members, offer procedures and a training program for the team leader to use while mentoring the team member. We also help recruit team members. Interested in developing your own team? 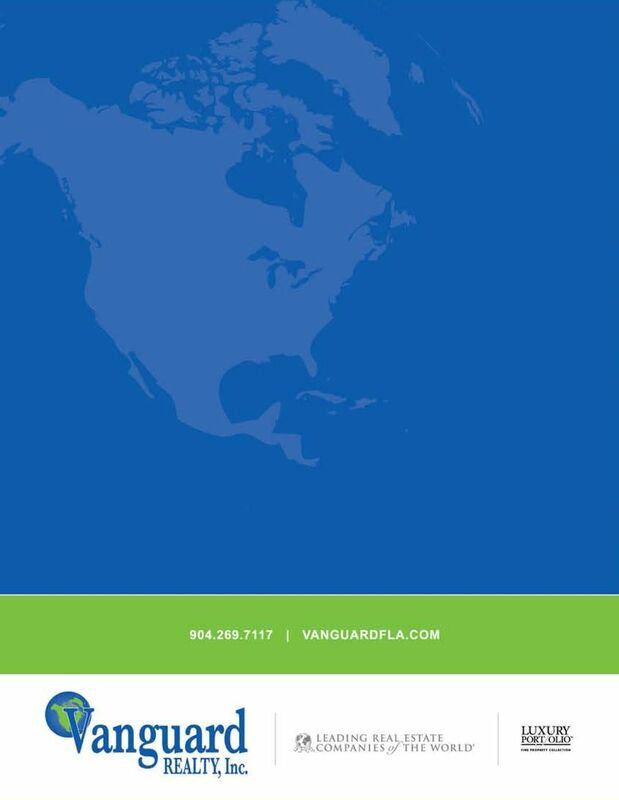 There is no better place to be than Vanguard Realty. RELOCATION With over 170,000 agents in our network, Vanguard is the Premier Agency that offers more broker-to-broker relocation business. With a full time Director of Business Development, and the best network in the business, relocation is definitely an asset for those agents who qualify and would like to participate. AGENT PRODUCTIVITY/ CONCEIRGE SERVICES Full time real estate agents need answers not just materials. That s why we created Concierge Service. Concierge Service is responsible for insuring that every Sales Partner receives the benefits of the many assets offered by Vanguard and designed to increase your business. The Concierge will assist you in setting up websites, maximizing your Internet exposure, obtaining no cost marketing, and establishing your own identity program. Concierge Service is available to you free of charge. Our Sales Managers are trained to work with the Concierge to help you develop business and marketing plans, establish budgets and bring an integrated effort to helping you grow your business. Have you ever felt that you were leaving something out or not getting everything you should from the money you invest in your business? You need to experience Vanguard s Team Approach. When new Sales Partners join Vanguard, they are frequently amazed how our program helps them succeed and ultimately leads to their success. You re Licensed. Now What? July 26, 2014 - Zuliagate -- The Big Secret Citron Exposes What the Press Has Ignored The stock market and the real estate industry are all abuzz about the possible merger of Zillow(NASDAQ:Z) and Trulia(NASDAQ:TRLA). 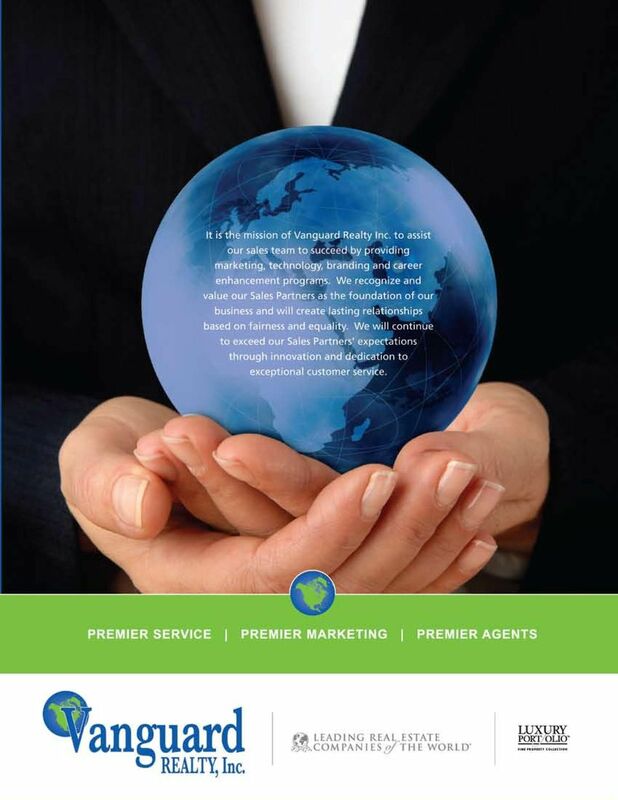 propm for Brokers Have you ever imagined having a high-end property management division within your company, but were deterred by the expenses, paperwork and challenges that come with opening such a venture? COACHING PROGRAM #1 Real Estate Coach tomferry.com 888.866.3377 1 COACHING GETS RESULTS you OUR COACHING MEMBERS 8 x MORE THAN THE EARN INDUSTRY AVERAGE Agents hire coaches to help navigate new technologies. Marketing Presentation Actual Professional Photo for a 54 Realty Group Listing Redefining Service in Real Estate Selling a home in today s market can be challenging - 54 Realty Group understands that. INTRODUCTION. Does this sound like you? Join us and become part of KW Luxury Homes International the Luxury Homes Real Estate Company of Choice.